This game was really off the track. I don’t think I’ve seen anything like this in recent history. 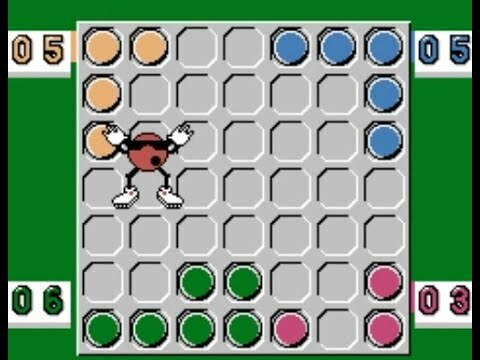 This game was essentially designed to advertise 7-up using their Spot mascot. 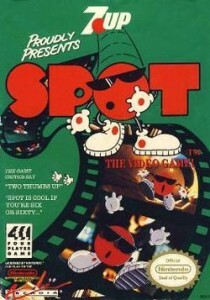 Come to think of it, I haven’t seen the Spot mascot in ages either. Coincidence? There really isn’t much to this game, it’s in the strategy genre, but it’s basically weird Othello or Reversi. You can play up to four players using 2 controllers, players need to swap controllers during play depending on who’s turn it is. With four players, each player starts in a corner and proceeds from there. 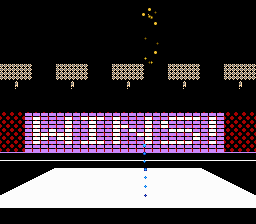 WIth two players, each player has a dot in opposite corners. Players can be computer controlled or player controlled. The goal of the game is to turn the majority of the squares on the board to your colour. Each turn you may move a dot two squares away, or replicate a dot next to one of your current dots. Select the dot you wish to use, and either click on an adjacent square, or one with an empty square in between. an animation before settling in the selected square. If your new dot is adjacent to any dots of another colour, they will flip to your colour. If you selected a square an empty space away your dot will re-locate to that spot. If your square was adjacent to your dot originally, a new dot will be created there. Ideally you don’t want to move your dots unless you have to. Sometimes jumping over an opponents dot will provide the best move – often it doesn’t. If you end up coming out on top with the most squares turned to your colour when they are all filled up – you win the game! It may sound easy and straight forward but the computer can be pretty tricky, and playing against a human opponent can be difficult and entertaining. Playing against 3 other human opponents makes the game crazy, you never know what is going to happen.